If you want a good laugh in this uptight, power-obsessed city, pick up a copy of Being Dead Is No Excuse. And if you are a Southerner, you will laugh until the tears come. Granted, death is no laughing matter, but Southern funerals definitely can be, as Gayden Metcalfe and Charlotte Hays show. The irreverent pair hail from the Mississippi Delta, and even though I grew up in Tennessee I recognize every character in the book. (I have no way of knowing if the people mentioned are real or invented. I have never met Metcalfe, who still lives in Mississippi, but Hays is a Washington journalist whom I do know.) The subtitle -- "The Official Southern Ladies Guide to Hosting the Perfect Funeral" -- pretty well sums it up, yet there is no way to suggest the fun of this book without quoting just about every tongue-in-cheek sentence. As an added bonus, each chapter concludes with wonderful, easy-to-follow Southern recipes, so you learn not only how to give a flawless funeral, but also how to prepare the foods that are necessary to this quintessential Southern experience. "After the solemnity of the church service and finality of the grave, the people of the Mississippi Delta are just dying to get to the house of the bereaved for the reception. . . . Friends and family begin arriving with covered dishes, finger foods, and sweets as soon as the word is out that somebody has died." Certain foods are essential for burying a self-respecting Deltan. "Chief among these is tomato aspic with homemade mayonnaise -- without which you practically can't get a death certificate." Others in the Top 10 list of funeral foods are fried chicken, stuffed eggs, Virginia's Butter Beans, Can't-Die-Without-It Caramel Cake, homemade rolls, banana nut bread, Aunt Hebe's Coconut Cake, Methodist Party Potatoes and tenderloin. Where you are buried is also very important. "The old cemetery is one of the best addresses in Greenville. . . . Being buried anywhere else is a fate worse than death." Cremation is still a "new and dicey" proposition in the Delta. "The last time somebody was cremated, his ashes were sprinkled from a crop duster. We all ran for cover. We liked him fine, but we didn't want him all over our good clothes." Appearance is important, too. Even in death, Southern women always want to look their best, and it was said that Bubba Boone, the local undertaker, could do a better job than any plastic surgeon. The ladies' advice for those who want a tasteful send-off, with "great vestments" but no "tacky hymns" or "smells and bells," is to join St. James' Episcopal Church. "Southern Episcopalians wear their devoutness lightly. That's one reason they excel at funerals. . . . They are sensitive enough to know that simply being dead doesn't mean you no longer care about social status." Metcalfe and Hays report that while there is no theological animosity between Episcopalians and Methodists, the culinary rivalry is cutthroat: "Episcopalians are snooty because they spurn cake mixes and canned goods, without which there would be no such thing as Methodist cuisine." But everybody has to look down on somebody, they observe, so for Methodists, there are the Baptists, who put "little bitty marshmallows" on their congealed salads. The writers tackle all the key issues. If you die a Methodist, they ask, can the mourners enjoy the full range of consolations? Maybe not. "If you feel your family will be so devastated by your departure that they'll require the solace of strong drink," they advise, "join St. James'. Immediately." The ladies insist that people do not "pass away." They die. One still writes condolence letters by hand. Paper napkins at the reception are verboten. As for music, "It is never a good idea to choose a hymn with a lot of high notes. . . . You can't go wrong with the old standards, like 'Oh, God, Our Help in Ages Past.' This will work well for almost anybody but the most out-and-out atheist." For obvious reasons, "The Battle Hymn of the Republic" is a no-no. They warn against "On Eagle's Wings," whose popularity " has spread like kudzu." As for flowers: positively no carnations or gladioli. In a chapter titled, "I Was So Embarrassed I Liketa Died," the authors remind us that, unlike the dead person, you will awaken and rise in the morning. Hence one of their most valuable bits of advice: You can have fun at a funeral, and especially at the reception, but "you don't want to have been so bad you wish you could switch places with the deceased." When Gayden Metcalfe and her good friend Charlotte Hays decided to write a book about Southern funerals exactly sure how a publisher would react. As it turned out, they had nothing to fear. The two Greenville natives simply went to the publishing company in New York City to pitch their idea and let their southern charm take over. When we went to Miramax to meet with three vice presidents, we didn’t even have a rough draft, Gayden recalls. But as soon as the two writers launched into some of their hilarious stories and observations about the traditions connected with funerals in the South, speaking, of course with heavy Southern accents, the big shots were ready to sign them up. 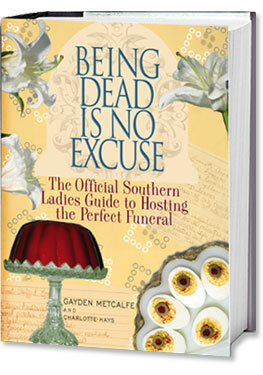 The result, Being Dead Is No Excuse; The Official Southern Ladies Guide to Hosting the Perfect Funeral is a charmingly witty and humorous book that tells you everything you need to know, and much, much more. The book will debut in Greenville on March 16 and McCormick Book Inn will host a signing that afternoon from 4:30 until 6. After that the two authors will embark on a signing tour throughout the Southeast. The latest published authors from the Delta combined their knowledge and experiences from growing up in Greenville into an entertaining book that contains some sound advice along with tales so funny they have to be true. The original title was Being Dead is No Excuse for Store-Bought Mayonnaise, but the publishers saw fit to shorten it. I had had the idea for ages and when Charlotte mentioned it to a friend of hers in the publishing business, she thought it was a great idea. Nothing had really been written about death, Gayden said. And it’s something we’re all going to do. Both Gayden, the inveterate hostess and Southern Belle and wife of Harley Metcalfe III, and Charlotte, a recovering gossip columnist who lives in Washington D.C., have attended their share of funerals. Not everybody is lucky enough to die like someone from the Delta. We die well, Gayden says with a twinkle in her eye. You know what they say about location. According to the book, the first thing a Southern Lady does when someone in her family dies is polish the silver. I’d be hard-pressed to tell you how many of our friends and their mothers have greeted the sad news of a death in the family by going straight to the silver chest and starting to polish everything inside, Gayden says. Maybe it has something to do with an atavistic memory of defending our silver from the Yankees, but it does ensure that the silver will be sparkling, which is nice for a funeral reception. And, of course, there’s plenty of information about food are all about food. As soon as word hits the street that someone has died, ovens all over town are being turned on. The book includes practical advice such as a list of everything you must keep in your Eternal Pantry in order to be funeral-ready at a moment’s notice. There are also recipes for some of the essential funeral foods northerner asked the question, What is aspic? and Gayden told them it’s congealed Bloody Mary without the alcohol.) Her mother attended many funerals when Gayden was growing up, and often she’d take little Gayden along with her, thus the learning began early. Time has passed, but the food hasn’t changed that much and what we do at funerals is unchanged, she said. The experiences paid off in later life when Gayden became a member of the Pastoral Care Committee at St. James’ Episcopal Church (the food committee for funerals). She and the other members have worked together so long, they know exactly what dish the others will bring. We always take the same thing, she said. Although most of her information comes from an Episcopalian perspective, Gayden also managed to infiltrate First United Methodist Church and she shares some of their recipes and traditions too. Knowing the importance of funerals, Gayden and Charlotte felt it was time there was a book on the subject. There are so many books on weddings and, if you think about it, you have to plan all the same things. People have months to plan a wedding, but with a funeral there are only a few days. We only have one chance to do it right, said Gayden. Being Dead is No Excuse is the guidebook we’ve never had. There are lists of dos and don’ts concerning food, flowers and music for funerals. The Delta Funeral Hit Parade covers songs that are Banned at St. James’, Canned at the Funeral Home as well as those For the Well-Bred Dead Person. The absolutely worst songs can be found under Being Dead Doesn’t Mean You Have Good Taste. And worst of all, The Battle Hymn of the Republic is labeled Ne-vuh Again! The book has gotten a good review (and a star) from Publishers Weekly which pleases the novice authors to death, so to speak. And they have received the ultimate compliment for a Greenville writer saying how much he enjoyed the book! Whether you are planning a funeral or not, this book is a great read. You’ll love the recipes and all the tips on hosting a great funeral reception. You can get a signed copy at McCormick Book Inn in Greenville and meet Gayden and Charlotte on March 16 as they introduce their new book to the Delta, and the world. The book is also available online at amazon.com.